« Is the villain the story? Really? I'd like you to take a look at this cover. Without knowing anything about the author or the story, what would you say it was about? And who would be the ideal reader? We had this book in the teen room when I started my job, with this (IMHO rather dreadful) cover on it. What teenager would take this out? It looks like a book for young children, about a little girl whose mean aunt won't let her keep a dog. Doesn't it? At any rate, the book did not go out. Which is a pity, because, like everything Diane Wynne Jones writes, it's quite chilling and well- written. Here is another cover image for the same book. That's rather better, isn't it? 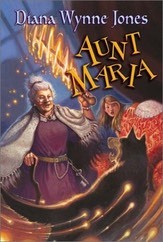 You still have young girl, mean aunt, and canine, but the canine is more obviously a wolf, the girl a young teen rather than a little child, and the aunt is more menacing - clearly both powerful and magical. I do think both covers represent the story pretty well, at least based on what I've read so far. But the second would be more appealing to young teenagers. Covers are tricky. As well as conveying something of the story, they are an advertisement of sorts - an inducement to open the book and begin to read. And, unfortunately, kids really do judge books by their covers. I hadn't realized how much they do this until I began work as a librarian. One of the reasons Patricia Dunn's fine book isn't going out as much as it should may well be the cover. What do you think? Which of the two covers above do you like better, and which would you have preferred when you were a young teen? Have you ever hesitated to read a book because the cover turned you off?